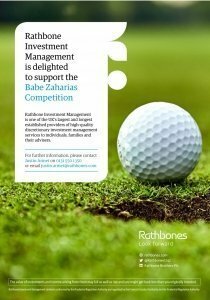 We are delighted to announce that Rathbones, one of the UK’s leading providers of investment management services, is to sponsor the 2019 Babe Zaharias Competition. The Babe Zaharias Open Ladies stroke play competition is to be held this year at The Musselburgh Golf Course on August the 19th. Entry forms will be available on the ELLCGA website from the 1st of June to the 31st of July 2019. Entry £25. Handicap limit of 30. The winners of the Babe Zaharias competition were presented with their trophies today at Gullane. The trophies were presented by the Gullane Ladies Captain Barbara Gibb. 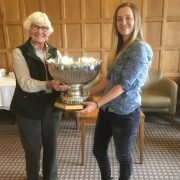 Leanne Wilson was presented with the Rosebowl for the scratch prize with a gross score of 72. 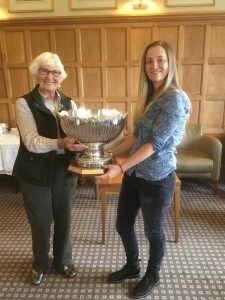 Liz Hilton received the Ultraplast Cup for the handicap prize with a net score of 66. 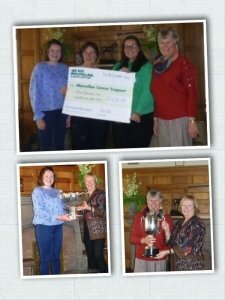 The big winners on the day were the Macmillan Cancer Support charity, their representative Pauline Macmillan was presented with a cheque for £4470. This brings the total raised for the charity over the past three years to £11,500. 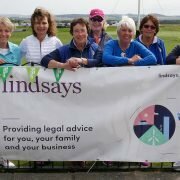 Many thanks to all those who have supported this competition, to Luffness GC for hosting it and to our sponsors Lindsays. The Babe Zaharias Trophy has proved once again to be a very popular event, and we have now filled all our available tee times and started a waiting list. For a list of accepted applications, please click on the link below. If your application has been accepted and you find that you are unable to play, please notify secretary@ellgolf.co.uk as soon as possible so that she can re-allocate your place to someone on the waiting list. We are delighted to be running The Babe Zaharias Trophy again this year in conjunction with Gullane Ladies’ Golf Club. This year is the 70th Anniversary of Babe Zaharias winning the British Ladies Amateur Open at Gullane, the only competition she played in Scotland. This year is also the 50th anniversary of the Ultraplast Trophy being donated as the handicap trophy. Entries open on 1st April 2017. 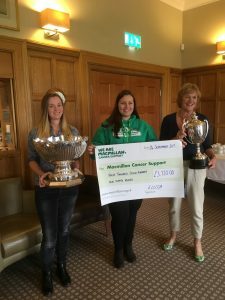 Since there was no prize giving on the day of the competiton a presentation is being arranged for Saturday 5th November when Julie Birdsall and Joyce Hunnan will be formally presented with their respective trophies and a cheque for £3,400 handed over to Macmillan. The CSS has now been confirmed at 75. Scores will be returned to home clubs. 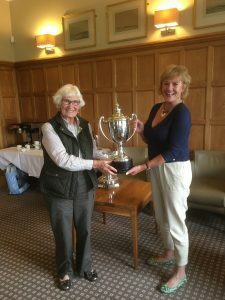 The decision last year to restore this ladies amateur golf competition for the Babe Zaharias Scratch and Ultraplast Handicap Trophies to a stroke play competition so far seems to have paid off. 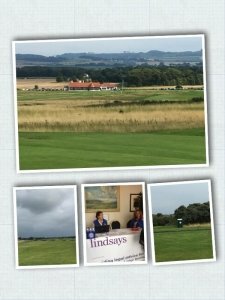 The competition which has been held annually as a fund raiser for cancer charities since 1963 will be played for the first time on Gullane No1 on 22nd August this year and has been oversubscribed with 20 currently on the waiting list. Interest has really been sparked and players from 43 different clubs will be taking part. Players are coming from 4 different clubs in England as well as players from Dumfries and Galloway, the Borders, Midlothian and Fife as well as a healthy representation from most of the East Lothian clubs. The nominated Cancer Charity this year is the Macmillan Cancer Support and the prizes have been sponsored by Principal & Prosper. The competition will be played at Gullane again next year to mark the 70th Anniversary of Babe Zaharias winning the British Ladies Amateur title at Gullane. Thereafter the competition will move on to another East Lothian Club. We are pleased to announce that Principal & Prosper, Financial Planners with offices in Edinburgh, Glasgow and Kelso have agreed to sponsor the prizes. As a result all entry money will be going to the nominated cancer charity McMillan Fund. Click on the link below to download further details and an entry form if you have not picked one up already. This tournament is held to perpetuate the memory of Babe Zaharias who was an exceptional US athlete and golfer, winning the British Ladies’ Amateur title at Gullane in 1947. She then turned professional and went on to win every major title before she died of cancer in 1956 aged just 45 years. Her husband, George, donated a solid silver bowl inscribed “Serbin Open – Miami 1955” to be competed for by "Lady Golfers in Scotland”. 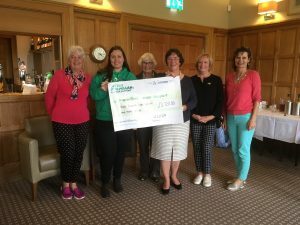 Torphin Hill GC hosted this prestigious championship for many years until Whitekirk took up the mantle, raising many thousands of pounds for Macmillan Cancer Support. 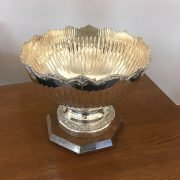 This is a new era for the rose bowl with East Lothian Ladies’ County Golf Association taking guardianship of the trophy and Gullane Ladies’ GC kindly offering to host the event for the next two years – 2017 marking the 70th anniversary of Babe winning the British Ladies at Gullane Golf Club. Proceeds will be donated to Macmillan Cancer Support.